Cummings Lane in 1949, extended through the new Chevy Chase Manor development. From Frank H.M. Klingé, Atlas of Montgomery County, Maryland, Volume Two, p 3, 1949. 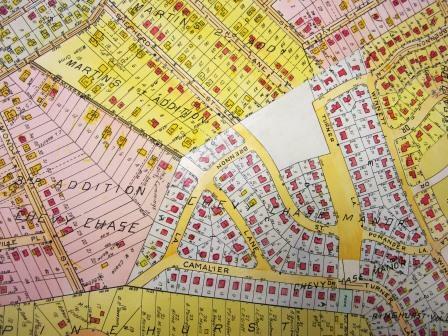 George Winchester Stone, Jr. described the shift from farm land to suburb in his 1990 oral history interview, remembering Cummings Lane when his family moved there in 1909. The Lane boasted only eight houses, compared to the thirty-six crowded along its sides today . At the east end, of course, stood the large Cummings homestead amid fields leading down to the Meadow Brook, the same that passed below the Brook farm and ultimately emptied into Rock Creek. The homestead remains standing on a small plot engulfed by the late sprawl of smaller homes. George Winchester Stone, Jr.
Over a century, all the farms in lower Montgomery County disappeared, making way for new homes and new communities. The Cummings family bought their one hundred acres in 1848 and by 1949, only a few clues were left of their way of life: Mary Cummings' farm house, a playground on land that had once been part of their farm, and a suburban street named Cummings Lane. The CCHS Oral History Collection includes Andrew Cummings' oral history, and more than 100 other interviews. They are all available for reading at the CCHS Archive and Research Center. Chevy Chase Historical Society has copies of a number of George Winchester Stone, Jr.’s memoirs and profiles in its archive collection, and readers are encouraged to visit our Archive and Research Center to read them in full. They are beautifully written, a pleasure to read, full of interesting information about the early residents of Martin's Additions.